Object photographed while a site was being surveyed. Mr. Mario Castaneda Marquez sends us an image taken in the municipality of Emiliano Zapata in the Mexican state of Morelos. 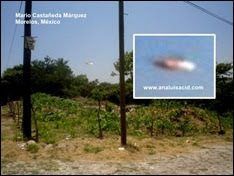 The photo shows an elongated, three-colored object that went unnoticed by the photographer when he pressed the shutter. "On August 14, 2009 I visted Colonia 3 de Mayo in Morelos to perform a site measurement and localization job (for municipal registration purposes). I took photos as a record for my client. I saw nothing unusual until I inspected the images." Mario also shows us other images that form part of the sequence taken at the time.